SIHH 2018: Audemars Piguet Royal Oak Offshore Diver Funky Colors ref. 15710ST. Live Pictures & Pricing. Last week we announced the release of a new set of colorful Audemars Piguet Royal Oak Offshore Divers ref. 15710ST. Today, we bring you our live pictures of the new watches and after reviewing them in the metal, we can tell you that our favorite ones are the beige, turquoise blue and the khaki green. While the purple is not as bad a everyone thinks, it is definitely not our cup of tea and a color that maybe just a handful of ultra cool ladies out there or perhaps our friend on Instagram @TheHorophile would be able to pull off and get away with wearing it. These four new colorful AP Divers are perfect for year round wear. These Royal Oak Offshore Divers still maintain their 42 mm case construction, display case back and are powered by the AP calibre 3120. All four new watches come with the traditional sturdy AP Diver rubber straps and rubber clad crowns matching the color of their dials. 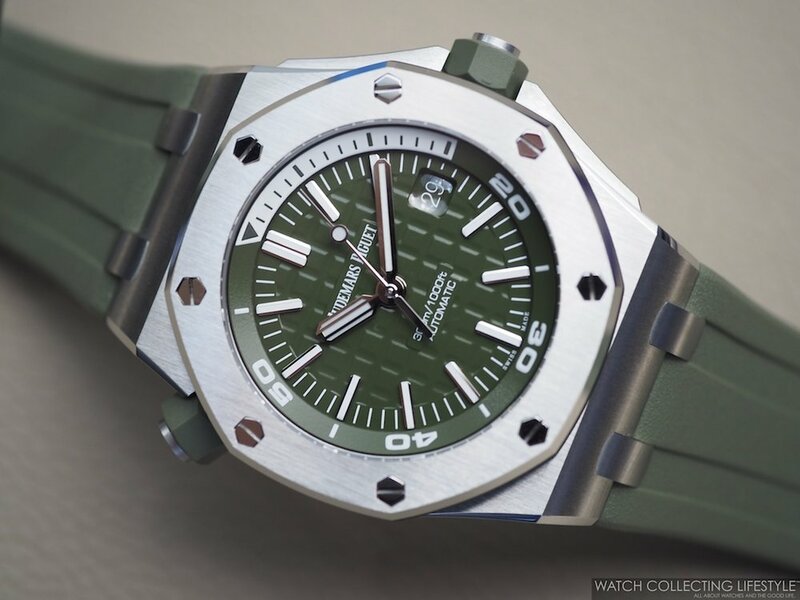 Whether you prefer bright colors or more discreet ones, these new AP Royal Oak Offshore Divers are sure to please almost everyone. The references by color are: Turquoise Blue ref. 15710ST.OO.A032CA.01, Beige ref. 15710ST.OO.A085CA.01, Khaki Green ref. 15710ST.OO.A052CA.01 and Purple 15710ST.OO.A077CA.01. While the turquoise doesn't appear to be very 'turquoise' in our live pictures, it is much more like the color of the stock images when looking at it in person. The rest of the colors are pretty accurate when comparing our live pictures to the way the watches look in real life. On the wrist, the new colorful Audemars Piguet Royal Oak Offshore Divers wear exactly like all other AP Divers but with an added touch of flashiness and true to their size. While the case diameter is 42 mm like on the Royal Oak Offshore Chronographs, the Royal Oak Offshore Diver wears much bigger as it has a slightly flatter bezel and a dial that is 1 mm wider than that on the Royal Oak Offshore Chronographs. As far as the new colors, we absolutely love the beige, the turquoise and even the khaki green. These new colorful AP Divers will be exclusively sold at the Audemars Piguet Boutiques worldwide and as far as the purple one goes, this one is exclusive to the AP Boutique in Geneva. Posted on January 22, 2018 by Editor & Publisher and filed under SIHH 2018, Audemars Piguet, SIHH and tagged Audemars Piguet SIHH SIHH 2018 Royal Oak Offshore Diver Khaki Green Royal Oak Offshore Diver Purple Royal Oak Offshore Diver Turquoise Blue Royal Oak Offshore Diver Beige Most Popular Audemars Piguet Royal Oak Offshore Diver Funky Colors 2018.